How long will Peter Griffin and the family stay in Quahog, Rhode Island? Has the Family Guy TV show been cancelled or renewed for a 15th season on FOX? The television vulture is on the lookout for all TV series cancellation and renewal news, so this page is a dedicated place to track the status of Family Guy season 15. Bookmark it or subscribe for the latest updates. Remember, the television vulture is watching your shows. Are you? An animated comedy airing on the FOX television network, Family Guy follows stereotypical sitcom dad Peter Griffin (Seth MacFarlane). Overweight and a bit dim, Peter is close to his kids, despite being a heavy drinker. A piano teacher, wife Lois (Alex Borstein) is a stay-at-home mother and usually the impatient voice of reason. An outcast at school, 18-year-old Meg (Mila Kunis) is the family’s preferred dumping ground. Overweight like his dad, 13-year-old Chris (Seth Green) is socially awkward and clueless, especially when it comes to women. The baby of the family, one-year-old Stewie (MacFarlane) is diabolically clever, if sexually confused. Rounding out the Griffin family is their dog Brian (MacFarlane). A ladies’ man who is particularly devoted to Lois, Brian is about one step away from AA. 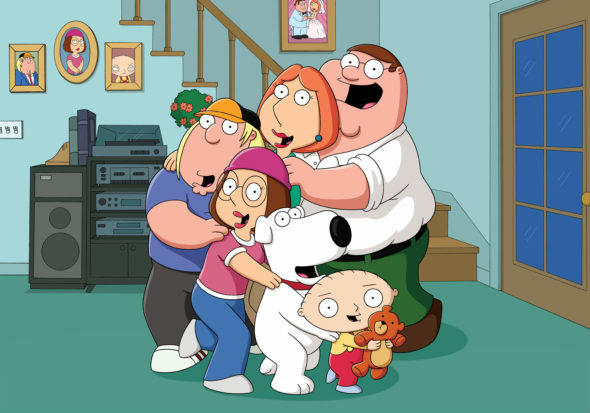 The 14th season of Family Guy is averaging a 1.33 rating in the 18-49 demographic with 2.86 million viewers. Compared to season 13, that’s down by 10% in the demo and down by 8% in terms of total viewers. Learn how Family Guy stacks up against the other FOX TV shows. In May, we learned that Family Guy had been renewed for season 15. It will debut on Sunday, October 1, 2017, at 9pm ET. Last year, Family Guy registered a sizable drop in the ratings, yet still managed a renewal from FOX. This season, the animated situation comedy is, so far, holding its own. Despite its longevity, Family Guy is still a solid performer among FOX TV series and makes oodles of money in syndication. As long as MacFarlane and crew are game to continue, expect FOX to renew Family Guy for season 15. Find more Family Guy TV series news or other FOX TV show news. What do you think? Do you hope the Family Guy TV show will be renewed for a 15th season? How would you feel if FOX cancelled this TV show, instead? Love family guy…keep it coming.. It would be amazing if FOX just up and pulled the plug on Family Guy. Even though the ratings have fallen it’s still a good draw, especially in the 18/49 demo that networks covet. I still think that Seth will end the show before FOX cancels it & when that happens it’s be announced that ‘X’ season will be its last. There won’t be this guessing game of ‘will they’ or ‘won’t they’ cancel it. *it’ll be announced that ‘X’ season will be its last. Unfortunately, they label some of their videos as season 15. I think they sometimes confuse production seasons and broadcast seasons. We go by what they publish in the press releases. I know Seth wants to end it. No show can go on forever. I still like it, however.